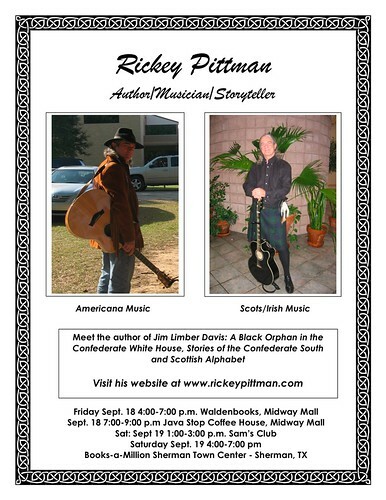 When I book a gig by myself (in those times when Tom can’t be with me—He is such a great singer), there are three song lists I do: Americana, Civil War, and Scots-Irish music. Today I wanted to post my Americana song list. Next to the song, I’ve listed the musician that I heard do the song. Some songs overlap genres. For example, there’s some songs I do in the Scots-Irish show that I sometimes do with this one. I left them with the Scots-Irish list, which I’ll post soon. I can do almost all these songs by memory. The list does not include my original songs that Tom is helping me record. As the CD nears completion, I’ll list those. Nor does this list include all the traditional country songs my father taught me that I can do on request usually. I’ve also got a Memorial Day song list for the military folks. There are many other songs I could have listed, but these are probably my favorites. I thought 30 would give you an idea of what I do. Facebook and my love for Pre-Raphaelite art led me to discover Grace Nuth, a librarian (this blog knows how I adore librarians and my other librarian friends are on my list to interview as well), and she is a beautiful and multi-talented lady who graciously consented to an interview. Though we touch on many issues and topics in the interview, the focus is on the art, personalities, and influence of the Pre-Raphaelites. I intend to follow up this interview with a blog entry compiling various quotations related to this most compelling of artistic movements. Below is the interview, followed by photos of Grace. Anything in brackets is added by me. 1. How did your love for Pre-Raphaelite art begin? It was a winding journey, but one with a definite destination! In 1993, I first heard the otherworldly voice of Loreena McKennitt, and was instantly captivated. Throughout the years, she has remained my favorite singer and a force in my life. One of her best-known songs, “The Lady of Shalott,” is based on the Tennyson poem of the same name. In 1995, while on vacation with my family, I came across a poster in an art gallery in a mall in the city we were visiting. I was instantly transfixed, and bought the poster without hesitation. It was of course J.W. Waterhouse’s famous painting of the Lady in the poem and song, and it was through Waterhouse that the path was opened to the original Pre-Raphaelite Brotherhood and all of their beautiful works. I was hooked. 2. Why do you think the Pre-Raphaelites have had such an attraction to you and to thousands of others? 3. What connection did literature have with the movement? Oh my…it might be easier to ask what artworks by the Pre-Raphaelites weren’t inspired by literature! The original goals of the Pre-Raphaelites were to paint according to nature, express genuine ideas, reject the things in art tradition that don’t work, and create good art…none of which includes anything about painting from literature. However, the Pre-Raphaelites were also romantics, and they were so inspired by the Romantic poets (Keats, Tennyson, Shelley, etc) that they began to paint pieces based on their work, as well as the classics of Shakespeare. It was in large part because of the romanticism of Rossetti, and the Arthurian fascination of dear friends William Morris and Edward Burne-Jones that the ‘second generation’ of Pre-Raphaelites became so intrinsically known for painting pictures based on poems, legends, and various stories. But the Pre-Raphaelites were no “mere” illustrators either. Their fondness of romantic literature was perhaps only eclipsed by their love for symbolism, and it is the use of this symbolism in their art (as well as the knowledge of art’s scientific principals) that elevate their work beyond being considered simply illustrative. 4. You yourself have been described as a “Pre-Raphaelite model.” In your mind, what kind of woman does this phrase describe? First, oh bless you…I have to give you an enormous virtual-hug for that comparison. To me, any physical compliment involving the Pre-Raphaelites is the absolute ultimate. And to be quite honest, I think any similarity can be attributed to the fact that from the age of 15-on, I viewed the Pre-Raphaelite woman as the absolute epitome of beauty to emulate. The Brotherhood were genius artists who based their work around a lofty ideal. However, they were also young gentlemen with libidos, and they didn’t hesitate to behave mischievously on occasion. They called the female models they discovered, usually in the lower-classes, as “Stunners,” and congratulated each other when a new one was discovered. But these women, although often delicate in looks and health, held an inner strength of character. I think especially of the movement’s two most famous ladies, Lizzie Siddal and Jane Morris. Both women were beautiful, in very different ways, but they both harbored mystery behind their eyes and had many secret talents: Lizzie exhibited talent at painting, and Jane was accomplished with the needle, as well as being a driving force behind both William Morris’ and Rossetti’s lives and careers. So, although I could go on and on about the physical appearance of the Pre-Raphaelite model (long red or dark hair, deep eyes, graceful hands, mysterious demeanor), the description “Pre-Raphaelite model” to me more represents a woman of strength of character and hidden depths. The women who were associated with the movement were absolutely remarkable ladies. 5. What books and films would you recommend to anyone wanting to study the Pre-Raphaelites? Edward Burne-Jones, Victorian Artist-Dreamer by Stephen Wildman et al. 6. Are there any trends or events associated with or promoting the work of the Pre-Raphaelites that my readers should know of? Well, if you live anywhere in the vicinity of London or Quebec, hie thee to the Waterhouse exhibit! There’s an amazing exhibit of his work going on right now, entitled Waterhouse: The Modern Pre-Raphaelite, and from pictures at its first stop in the Netherlands, it’s remarkable. I also have to give a shout-out to the William Morris Society (which, sadly I have not the funds to join, but greatly admire) who regularly hold absolutely wonderful-sounding talks and events, especially around the New England area. 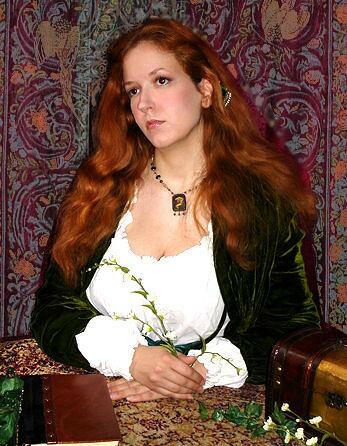 A couple of years ago, a few kindred spirit friends and I jokingly discussed starting a “Pre-Raphaelite Convention,” which would be an absolute dream…a mixture of Medieval Festival, Victorian Fest, with food, scholarly discussions and panels, and booths where one could buy artisan items inspired by the Pre-Raphaelites. Ah, if only. Perhaps someday it will be real. I’ve been pondering this question for a few days, ever since you asked it, and I have to give a somewhat cheating answer. I’d request permission to do a top-5 list rather than just one, since there are so many incredibly delightful stories about the P.R.B., it’s so hard to choose one in particular. 3. The meeting of Fannie Cornforth. Depending on who tells the story, Fannie, one of Rossetti’s favorite models, either met the artist when she thew nut shells at him in the park, or when a group of the rowdy artists bumped into her on a crowded street, “accidentally” dislodging her hair until it tumbled around her shoulders. Both stories have their incredible charm, and either way, I love them! 2. Si Je Puis. This was William Morris’ personal motto, and means “If I can.” However, during the early days of Red House, (Morris’ beautiful home he had built for him and his new wife) one sneaky trickster among his friends modified a set of scrolls on the wall, inscribed with the motto, to instead read “As I can’t” in Latin. 1. …But I love you. Although I love all the humorous tales of the Pre-Raphaelites, my favorite story has to be William Morris’ declaration of love for Janey on the canvas for his painting. When he first met her, he asked to paint her portrait as Queen Iseult, and he quickly grew frustrated at his lack of ability to capture her on the canvas. As legend goes, he wrote “I cannot paint you, but I love you” on the canvas (I have read that it was on the painting itself, and also that it was on the reverse side), shyly declaring his feelings for her. It would be his only ever completed oil painting. 8. How would YOU define “Pre-Raphaelite”? This is of course not an exhaustive definition of Pre-Raphaelite, but it is certainly how I would define it! 9. Tell me about your own personal art and your thoughts on creativity. Art has been an intrinsic part of my life since late elementary school. My parents encouraged my passion for it, and I had several art lessons throughout school. I came very close to making art my college major, but changed at the last minute when practicality screamed at me that an English degree would be far more helpful towards career acquisition than a Fine Art degree. However, I never stopped loving art. Most recently, inspired by the Pre-Raphaelite desire to create beauty all around them in their decor as well as their canvases, I’ve started painting unfinished wooden boxes with illustrative acrylic artworks. I also have painted murals on my walls and on the windows of the library where I work, and I’m currently working on a large mermaid painted with acrylics on a piece of wood that will be cut out and will act as a sign for the Sci-Fi/Fantasy section of the Teen department at the downtown library. Like many of the Pre-Raphaelites, I prefer to paint and draw figurative subject matter, and those from fairy tales, legends, myths, and stories. On a more theoretical level, I view the artistic pursuit of beauty to be my spiritual goal. I pursue this in all aspects of my life, and the new discovery of something beautiful is a source of elation and joy. 10. You and I have a mutual love for the art of John William Waterhouse. Tell me how Waterhouse fits into the Pre-Raphaelite discussion. What are your favorite works by Waterhouse? Ahh, Waterhouse—the font of beauty. I truly feel that art simply gets no better than his work. J.W. Waterhouse both is and is not Pre-Raphaelite. By the strictest definition, he is not…he was not a member of the original Brotherhood, nor was he part of the second wave of artists (Morris, Burne-Jones, Rossetti, who was also an original member). His art could also be defined as Classicist because of his love for Greco-Roman imagery. But in many ways, his art is intrinsically Pre-Raphaelite, thus the catalyst for the name of the current exhibition of his works. I think I love Waterhouse not only for the intrinsic beauty of his images, but because his art style straddles the lines between the photographic realism of the first-generation Pre-Raphaelites, and the looser style of the Impressionists. If you look at Waterhouse’s art, much of the backgrounds and side details are rendered thickly and vaguely, but his central figures are always painted with absolutely flawless precision. 11. I believe you frequent Renaissance faires. Tell my readers something they likely don’t know about working for or with such events. 12. Tell me a little about your blog and any website you promote or are associated with. This book, written by by Col. Tom C. McKenney (Marine Corp), relates one of the forgotten stories of America’s Civil War. It is a must read. It tells the story of Jack Hinson, who became a Confederate sniper with a vendetta who killed over 100 Federal soldiers. Each kill was marked on his rifle, which I’ll soon post on this blog. I’ll soon have another post with quotes from Mc Kenney’s book (Pelican Publishing). 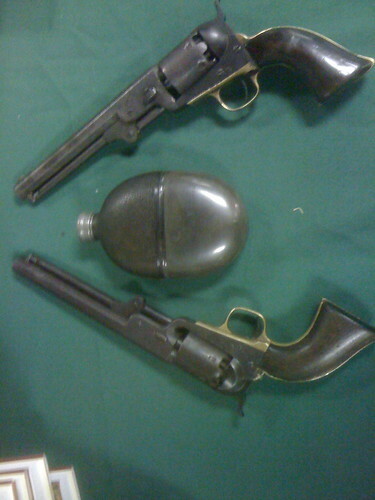 Here is a photograph of Hinson’s pistols and a whiskey flask that belonged to Nathan Forrest. I also have the letter from the family that tells of the flask. I’m here in the beautiful city of Hot Springs, but so far it’s been almost totally work. The pace rages from pitifully slow with nothing to do at my table to a mad, frantic pace, talking constantly to those who pass by my table. I’ll post some photos of my trip soon. Here are the lyrics for a new song I’ve written. They were inspired by the books I read about Townes Van Zandt, To Live’s to Fly and A Deeper Blue. For the memories of time? When did they decide to go? Where are the songs I want to write? What muse will send them in the night? They’re living in my dreams. “Only willful ignorance could ignore the charge of magic in the air. Only a group lack of imagination could account for people not wondering what went on in the dark around them” (11). “Most peoples’ minds don’t bear reading. Their thoughts are boring, disgusting, disillusioning, but very seldom amusing” (11). “I knew so many secrets, but almost none of them were my own” (54). About vampires: “Or maybe it was centuries of conditioning that made the difference, decades of disposing of people as they cose, taking what they wanted, enduring the dichotomy of being the most powerful beings on earth in the darkness, and yet completely helpless and vulnerable during the hours of light” ( 227). Once again, I find myself staying at my parents’ house in Kemp, OK and writing in the Sherman Panera’s. I am attending the 30th Anniversary Season of the Oklahoma Shakespearean Festival. This is the 4th season I’ve been able to attend. Friday night, I saw Shakespeare’s 12th Night. I found it to be a very good interpretation of the play. Directed by Aaron Adair, the setting was South Louisiana and surprisingly, the setting worked and flowed with the language of the play. Every time I see a Shakespeare play, I’m reminded of how many common quotations come his plays. I also come away with quotations to look up. For example, I had not realized that the famous quote “Be not afraid of greatness; some are born great, some achieve greatness, and others have greatness thrust upon them” came from this play. I also noticed some quotations regarding Puritans that I intend to study further. (ominous, considering what the Puritans did to theatre in those days). Last night at our SCV meeting, I met Jared Reeves, who is quite a collector of Confederate items. Now, anyone who knows anything about the Civil War at all know that Confederate relics are much more sought after than Union relics and are also almost always far more expensive. Jared had two extremely rare items that he showed us last night. The first was a Dance Brothers revolver. You can read about the Dance brothers here and here. 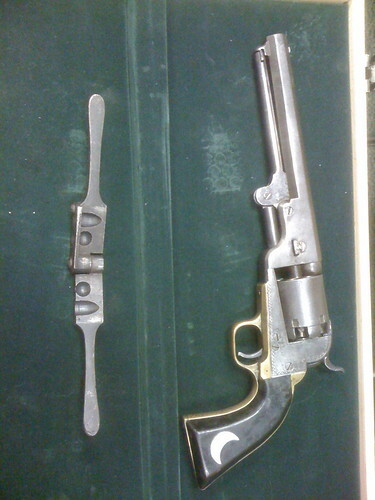 This is a .44 caliber and the rarest model of Confederate pistol. Reeves said that only 10 in any condition are known to exist. I don’t know many who have even seen a photograph of the pistol. Along with the pistol is a bullet mold, said to be as rare if not more rare than the pistol itself. I believe Reeves said that the Dance Brothers revolver competed with the Walker Colt (made for Texas Rangers) in market value. That pistol is another story you should look up. 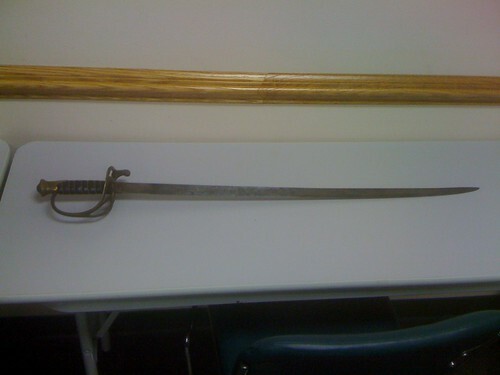 The second item he showed was a sword, made in Nashville by the College Hill Sword Works. 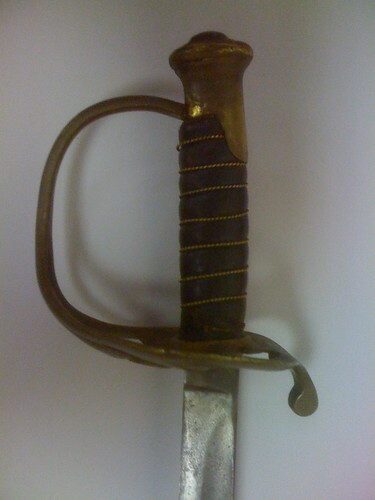 This company and Nashville Plow Works (Sharp & Hamilton) swords and other edged weapons. Both were only in existence for only a few months before Nashville fell. You can read about these companies and other Confederate manufacturers here: When I looked closely at the blade, I could see the First National Confederate flag engraved there. 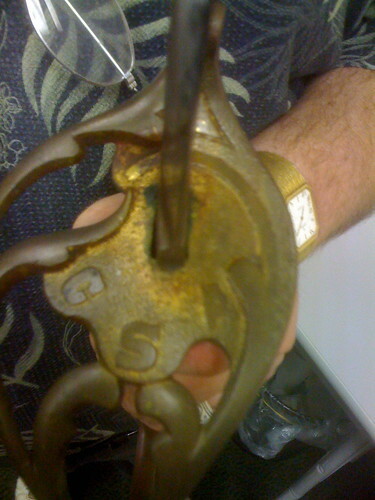 Here is a photo of the sword, the hilt, and a shot of CSA from a top angle. A very rare and expensive piece. When Lisa Stock agreed to be interviewed for my blog, A Southern Missive, I was ecstatic, and I have to say that she provided a superior in-depth interview. This talented and beautiful lady is a filmmaker, writer and actress working in the mythic arts. She pulls her stories from a varied background of theater, film, and anthropology. She is the author of the novella The Sun, and the online Victorian allegory Through the Cobweb Forest with artist Connie Toebe. Her films include: The Medisaga Trilogy, The Silent Nick and Nora, and Brother and Sister. When not writing or making films she loves to bake and dance flamenco. She lives online at http://www.inbytheeye.com/ and lives offline in New York City. Here are my questions and her responses. 1) When in your life did you know you would be a filmmaker? I was about four! Watching the Wizard of Oz every year on television captured my imagination. And I remember asking once when I was very young, what it was – this colorful, musical, frightening tale come to life in a little box in my living room? My dad told me it was a movie – that they made them in Hollywood and I could do that too. I never looked backed. So, your love of film has been lifelong? Pretty much. Especially the fantasy and mythic films. Anything Jim Henson did, I wanted to be a part of. I love the scope, the movement, and being visually swept away. All of my work is heavily influenced by fairy tales and mythology. Not only that I use the characters from these famous tales – but also the themes. Take for instance, the classic Hero’s journey of “separation, initiation and return” – in The Medisaga Trilogy I’ve given that journey to a heroine, Titania, and it will take her through many of the archetypes and lessons that the great classic heroes of mythology went through, such as a trip to the Underworld, a rebirth, and healing. 3) You have several films to your credit. Tell me a little about the films you’ve completed and are working on now. 4) What advice would you give those thinking of making films? Is there a certain progression/order of steps to follow? I think of myself as a storyteller first with film being my medium of choice. I’m a visual storyteller. I would ask anyone who is thinking of making a film – Why choose film? Is it the only way to tell your story, is the best way to tell your story, is it the way in your heart to tell your story? If they say yes – then wonderful! Stay true to yourself – you’ll find your audience. That’s one of the best things about the internet – those who share your love of a particular genre, style, or story can find you even if they’re halfway around the world. What jobs have you had in the film business that helped you gain skills or understand your craft? Is there a book you’d recommend? I graduated from the Hunter College (CUNY) film program at a time when we were still cutting and splicing film negative (ha!). But I’ve had an education in the digital age through working in an editing dept at an events company, and on the edit system I have on my computer at home. A lot of it has been trial and error. But I’d really recommend an internship, or a P.A. job for those just starting out – you learn so much outside the classroom and on an actual set. Go make a movie! Rather than a book to recommend, I would tell those interested to watch the behind the scenes features on their dvds. I shoot everything outdoors. I love to shoot in nature! Three behind the scenes features that have taught me a lot are from: a Brazilian film called The House of Sand, a Russian film called Russian Ark, and any of the commentaries on Peter Jackson’s Lord of the Rings trilogy. Filmmaking is a team effort – truly. You must be able to work with other people. If you’re outdoors in 25 degree January weather with three script pages to shoot before you lose your light at 4pm, you’ve got to be able to work together to get it done! 5) Where can my readers find some reviews of your films? My work will also be featured in the Fall ‘09 issue of Faerie Magazine. Do check out the website press page for more articles coming out later in the year! 6) What schools would you recommend for filmmakers? What regular college classes are good for those interested in filmmaking? 7) Tell me about your creative process? For me, actors and crew are also storytellers. As a director, I know exactly what I want – but I like to give cast/crew room to breath – be artists and have some freedom when bringing a role to life, or shooting a scene. Otherwise, if I had only let them do it as I saw fit, I may have missed out on a brilliant spark of inspiration on their part. My job as a director is bringing them to a place where they feel confident and comfortable with the material, with me, and each other to let their own creative ideas come through. All of my stories are deeply personal, but I also hope each cast member, crew member, and audience member will find their own story in my films too. On the Titania film page there’s a behind the scenes documentary which gives you a glimpse of our creative process. 8. Please tell me all about your acting experience and thoughts on acting in films like yours as well. I’ve been an actress for over 30 years. I sometimes write a small role for myself in my films too. It’s just too much fun! (That’s me playing Nora in The Silent Nick and Nora, and I’ll also be in The Medisaga Trilogy). But I’m glad you asked this question – particularly in relation to the fantasy genre. When casting – I always call those in for auditions who have had the strongest theater training. Film and theater acting are entirely different – but I look for those who are comfortable with formal language and body movement, and find theater trained actors to have the broadest imaginations. They have to – they have little extemporaneously to work with on a stage. So, although they will pull in their voices, and restrain their movements a bit for a camera close-up – story wise, theater experience gives them an ability to make fantasy very real. I like to rehearse a lot before going on set too. I want the actors to be as comfortable as possible with their character’s extraordinary situations, and play them real. When you have a story that is so “fantastic”, if your actors overplay it, the audience won’t believe it. Fantasy film lovers are sophisticated people, yet willing to suspend their disbelief and walk into the world you’ve created without question. But they still look for integrity and sincerity. And those are the two things I put at the top of my filmmaking list no matter how far away from reality the story drifts. Here is a shot of Lisa Stock in the new beautiful Greek & Roman art hall at the Metropolitan Museum Art. April 2009. I can’t be alone tonight. You said you’d be there till I died. Stay until the morning light. But he paid the blues the most.